The speaker at my guild’s meeting last night was Rose Hughes! 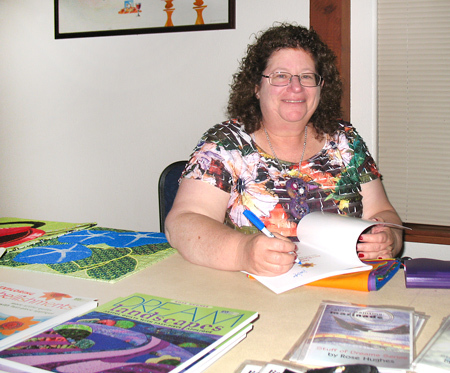 Rose is the author of Dream Landscapes, which was previously featured here on the blog. 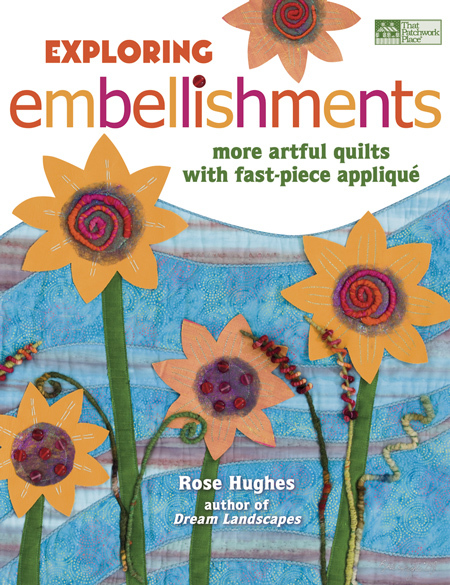 Now Rose has published a beautiful followup book, Exploring Embellishments: More Artful Quilts with Fast-Piece Appliqué. I just so happened to have a copy with me last night, which Rose graciously signed for us! That’s right, courtesy of That Patchwork Place we have a fantastic giveaway to a lucky winner of the book personally signed by the author. Rose’s lecture was all about color, and about each quilter’s personal color journey. 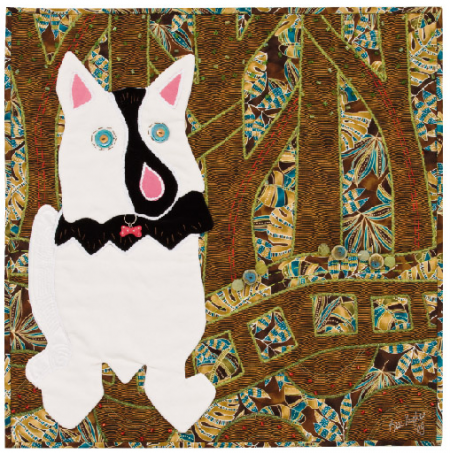 We had the treat of seeing her color-drenched, fast-piece appliquéd and embellished quilts in person as she displayed a trunk show of her work. On her website, Rose has a free Color Discovery Lesson. Check it out! Exploring Embellishments focuses on the embellishment side of Rose’s work, taking us through all different types of fascinating doodads. Some were a surprise to me! I was familiar of course with buttons and with seed beads and bugle beads, but I never knew about coin beads or pressed glass/lampworked beads. They’re beautiful! Rose also urges us to consider a range of natural materials and found objects. Basically, anything that has a hole in it or that you can get a hole through, you can use to embellish your quilt! I had never heard of air-dry clay. How very interesting! Rose also has good times with Angelina fibers, chenille sticks, wool roving, and the Mysterious Substance called Lutradur. You’ll see how to use these materials and more to fabricate your own unique embellishments. Each project in the book is an embellishment learning experience, starting with Fast-Pieced Appliqué to create a colorful, interesting background. To enter the drawing to win the book, leave a comment here on the blog before 7:00 p.m. California time on Friday, April 15. The contest is open to U.S. and Canada addresses only. If you’re subscribed by email or feed reader, remember to click over to the blog itself to leave your comment. Definitely wanted to be a part of this opportunity to obtain a copy of the book, signed even :) Thanks so kindly. I will for sure buy it if I don’t win it. I am always on the lookout for new embellishment inspiration which is not too “over the top” and modern if you will. That is exactly what I need, would love to win a copy. I love to add embellishments and stitches to my pieces, and like books that have exercises and fun projects to practice them with. I just think it’s so cool to have the opportunity to meet the author and get autographs. I’d love a copy of the book, I really need to look up the first one DLandscapes. It looks awesome. Thank you Kay for the opportunity to win this book. 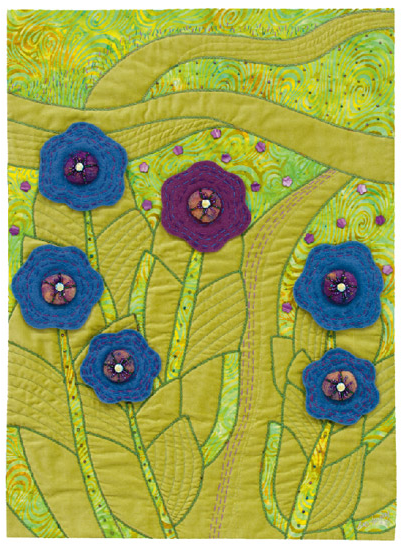 I am fascinated by the idea of embellishing applique. Just another whole dimension to this wonderful artform. What a GREAT book! And talk about color-drenched quilts! Would love to own this book. Being signed is a real bonus. Thanks for the opportunity. Thank you so much for sharing this wonderful book. Looking forward to seeing it. Looks like a fantastic book! Great giveaway! I’d love to win this book! Thank you Kay! thanks for a shot to win this book! I think color and stepping out on our own with its use is one of the greatest buggaboos that today’s quilter faces. We (or at least I) don’t seem to trust my own judgement and then become paralyzed with fear that I am doing something “wrong”. I will definitly take a run over to the color lesson and give it a try! 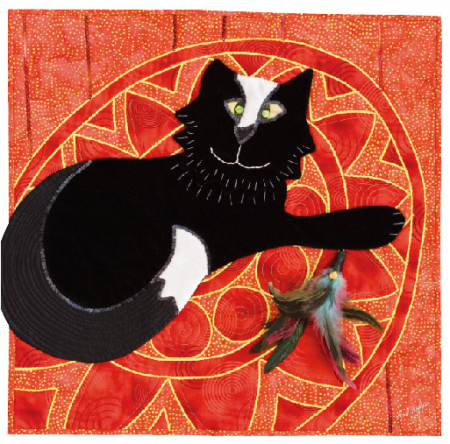 Love the cat with it’s feather toy. What a great way to continue the process of learning to applique. 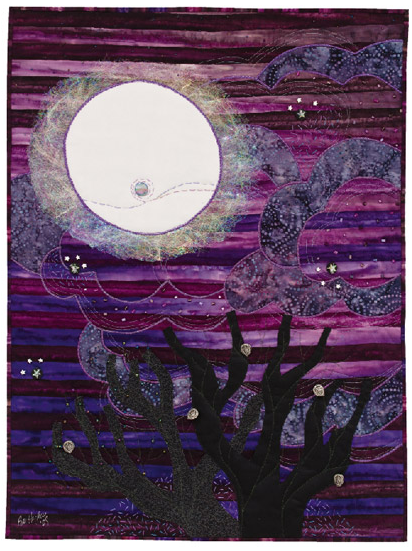 Embellishment will put the Baltimore Album Quilts into the 21st centruy. I book marked her color lesson. It had some great info. Thanks for the chance to the book. The book looks great – I’d love one!! I do have a question that maybe someone can answer. When sewing on embelishment – is that done before or after quilting – and do you let the stitching show on the back if after quilting? I love to sew “stuff” on quilts. I’m thinking that I might do what some crazy quilters do – sew on a false back. The quilt is sandwichec and quilted, then emblelished – then a false back is applied and maybe attached with stitcching in the ditch – so all the knots, etc are not shown on the back. Wow I just discovered this site and I am blown away! Especially by the Exploring Embellishments. I will have to make a trip to my local book store to get a copy.The inspiration here is just that “inspiring” and the techniques are easy to understand.Thank you for such an informative site.